Joe DeLaRonde is a master blacksmith. He started his blacksmithing career 35 years ago as an apprentice under a master German blacksmith. His works are in use around the globe by military personnel and living history enthusiasts, as well as in private collections and museums in the United States, Canada, Mexico, and Europe.Through detailed but easy-to-understand instructions, illustrations, and photographs, he teaches the basic skills of forging. Here is all the information you need to create artistic yet functional iron hardware and accoutrements for home or ranch, including: pokers, shovels, tongs, hooks, camp sets, forks, spoons/spatulas, skewers, nails, hinges, latches, drawer pulls, coat hooks, towel bars, candle holders, brooms, hoes, crowbars, awls, screwdrivers, chain links, chisels, hammers, adzes, axes and knives. DeLaRonde continues to work in his shop in Mancos, Colorado.and Europe.Through detailed but easy-to-understand instructions, illustrations, and photographs, he teaches the basic skills of forging. Here is all the information you need to create artistic yet functional iron hardware and accoutrements for home or ranch, including: pokers, shovels, tongs, hooks, camp sets, forks, spoons/spatulas, skewers, nails, hinges, latches, drawer pulls, coat hooks, towel bars, candle holders, brooms, hoes, crowbars, awls, screwdrivers, chain links, chisels, hammers, adzes, axes and knives. DeLaRonde continues to work in his shop in Mancos, Colorado, producing some of the finest tomahawks, axes, and knives available on the market today. 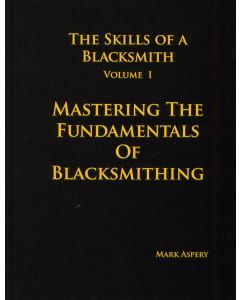 An excellent presentation of the technical aspects of blacksmithing as well as the basic fundamentals. Physics and chemistry are translated into an easy to understand language. Format: Hardcover. Dimensions: 8.75" x 11.5" Pages: 300 Illustrations: 1,118. 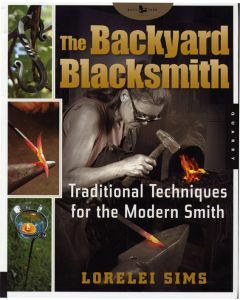 The Backyard Blacksmith shows how - with some patience and a working knowledge of metals, basic tools, and techniques - blacksmithing can be easy to learn and a rewarding hobby. 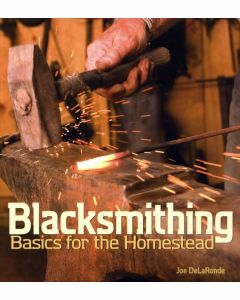 Detailed step-by-step full-color exercises, clear photographs, drawings, and descriptions teach all the universal skills and techniques used to forge iron; like having a master blacksmith by your side. It provides the reader with an understanding of the properties and characteristics of forging hot metal, making the craft accessible to those without previous experience. More than 20 detailed, beautiful and functional step-by-step projects organized by difficulty level including all the techniques needed to succeed. Try it!